Peter Parker was born in Botley (then in Berkshire) in 1819 and was baptised at North Hinksey Church on 19 September. He was the son of John Parker of North Hinksey parish and Sarah Pimm of Eynsham, who were married at North Hinksey on 30 August 1802. His parents had eleven other children baptised there: William (1803), John (1804), Mary Anne (1807), George (1808), Charles (1810), Sarah (1812, died Botley 1827), Ann (1813), Henry (1815), twins Hannah and James (privately baptised on 9 August 1818 and buried there together on 6 September), and Jane (1821). Peter's mother Sarah died in Botley at the age of 47 in 1826, and his father died there at the age of 66 in 1841. Mary King was born in Wytham (then the northernmost tip of Berkshire) in 1821 and baptised there on 22 April. She was the daughter of Robert King of Wytham and Susan or Susannah Greenaway, who were married at St Michael's Church in Oxford on 16 October 1817. Robert King was working as a temporary land steward in Fulbrook when their first son Frederick was born in 1818, and he was baptised there on 22 March. Their next nine children were baptised at Wytham: Joseph (1819), Mary herself (1821), Charles (1823), Martha (1825), Harry (1829), Charles Martin (1831), Miranda (1833), Robert (1835), and Susan (1838). By the time of the 1841 census they had moved to Oxford, and Mary (20) was living in George Street in St Mary Magdalen parish with her father Robert, who was a coal merchant, her mother Susannah, and six of her siblings: Frederick (about 23), who was a coal merchant & auctioneer; Joseph (21), who was a male servant; and Martha (15), Charles (9), Miranda (8), and Susan (2). Percival Charles Parker (born in Summertown in 1857 and baptised there on 25 March). Peter and Mary Parker began their married life in Botley, where Peter worked as a baker. At the time of the 1851 census Peter (31), a baker and Mary (30) were living at Botley with their first two children Susan (6) and Helen (4). By 1855 they had moved to Summertown, where Peter was working as a fishmonger. At the time of the 1861 census Peter (41), described as a fishmonger's porter, living at 6 Russell Place, Summertown with his wife Mary (40) and his children Susan (16) and Helen (14), who were described as being at home, and Joseph (7) and Percival (5), who were at school. In 1871 Peter (61), now described as a fishmonger’s shopman, was living at 2 Field View, Summertown with their daughters Susan (26) and Helen (24) who were both dressmakers, and their sons Joseph (17), who was a printer compositor; and Percival (16), who was listed without an occupation. In the third quarter of 1880 in the Brackley district, Joseph Townsend Parker married Mary Anne Barrett, who was born in Marston St Lawrence, Northamptonshire. At the time of the 1881 census Peter (61), a fishmonger's manager, his wife Mary (60) were living in part of Field View, Banbury Road with their son Percival (25), who was described as an ex-policeman. Their first grandchild Ethel Mary Parker, the daughter of his son Joseph and his wife Mary Anne, was born in Summertown soon after that census and baptised there on 12 June 1881. Between 1881 and 1889, Peter Parker retired with his wife to 11 Farndon Road, north Oxford. 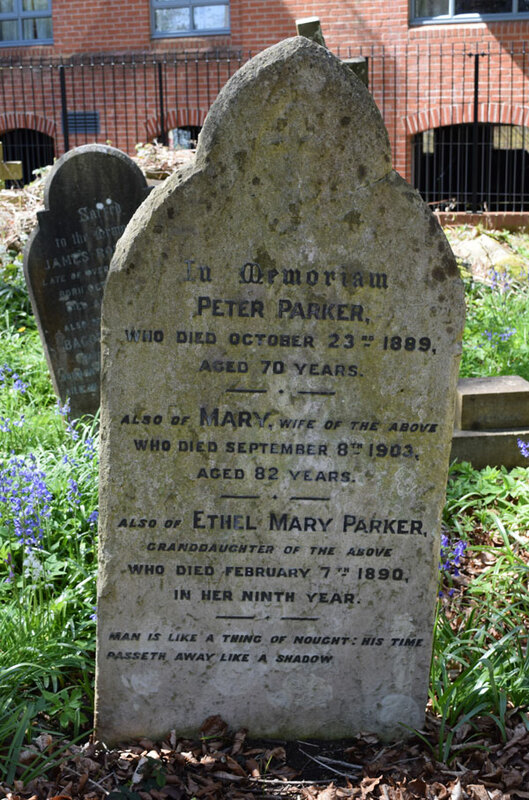 † Peter Parker died at 11 Farndon Road at the age of 70 on 23 October 1889 and was buried at St Sepulchre’s Cemetery on 27 October (burial recorded in the parish register of St Giles's and St Philip & St James's Church). 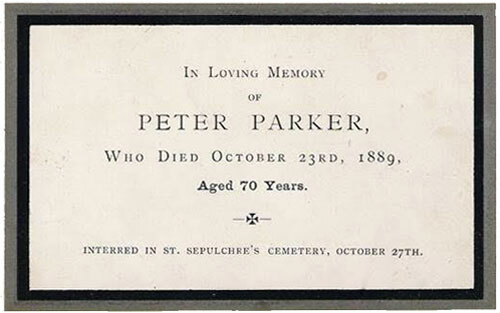 Right: Peter Parker's memorial card. His personal estate came to £308 7s., and his executor was his son Joseph Townsend Parker of 5 Banbury Road, who was a printer's compositor. † Ethel Mary Parker died at Farndon Road at the age of 8 years 10 months on 7 February 1890 and was buried at St Sepulchre’s Cemetery on 11 February (burial recorded in the parish register of St Giles's and St Philip & St James's Church). 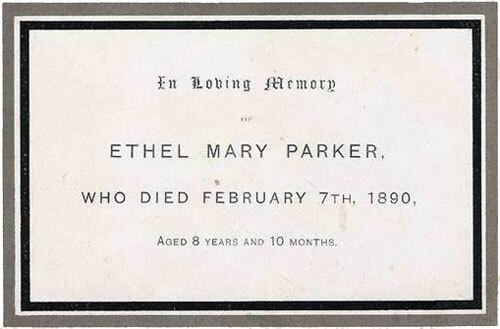 Right: Ethel Mary Parker's memorial card. On 4 July 1895 at St Giles's Church, Oxford, Percival Charles Parker, described as a fish salesman of 11 Farndon Road, married Sophia Esther Gammon of 19 Banbury Road, born in Headington, the daughter of the sawyer Phelp Gammon. By 1901 Mary (80) had gone to live with her son Percival and his wife and children at 30 Beechcroft Road. † Mrs Mary Parker née King died at 30 Beechcroft Road, Summertown at the age of 82 on 8 September 1903 and was buried at St Sepulchre’s Cemetery on 11 September (burial recorded in the parish register of St Giles's and St Philip & St James's Church). 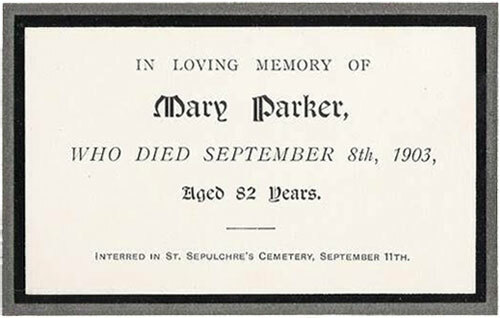 Right: Mary Parker's memorial card. Susan Sarah Parker, Mrs Salter (born 1845) may have died soon after her wedding, as Robert Salter, who described himself as a widower married Florence Cook in Fulham on 21 August 1883. He was a cabinet maker in 1911, living in Oxford with Florence. It is, however, hard to find the death of Susan Sarah Salter, and it is just possible that she was not dead, as a Susannah Sarah Salter of the right age (64) died Croydon in 1910. Helen Mary Parker, Mrs Steff (born 1847): see her separate grave. Joseph Townsend Parker (born 1855) was a compositor. At the time of the 1881 census Joseph (27) was living at 5 Albert Road, Summertown (now renamed Hobson Road) with his wife Mary Anne (24) and her unmarried sister Ellen Barrett (21). Their five children were all baptised at Summertown: Ethel Mary (1881), George Stanley (1883), Olive Beatrice (1885), Joseph Townsend Parker junior (1888), and Hilda Constance Parker (1892). His eldest daughter Ethel died in 1890 (see above). At the time of the 1891 census Joseph (37) and Mary Anne (34) were living at 1 Victoria Terrace, Banbury Road, Summertown with their three surviving children. There last child was born the following year, and In 1901 they were living at 7 Oakthorpe Road, Summertown with their four children: George (18) was a tailor & outfitter's clerk, and Olive (15) was a bookseller's assistant. They were still at that address in 1911, and only their youngest child Hilda (18), who was a stationer's assistant, was at home. Joseph Townsend Parker died at 7 Oakthorpe Road at the age of 91 on 18 June 1943. His effects came to £2,104 2s. 6d., and his executors were his son George Stanley Parker, who was still a tailor's clerk, and his widowed daughter Mrs Olive Beatrice Towl. Percival Charles Parker (born 1857) worked as a fishmonger in Summertown. He and his wife Sophia had four children baptised at Summertown Church: Alec Percival Parker (1896), Dorothy Mary Parker (1897), Esther Susan Parker (1898), and Norah Sophia Parker (1899). At the time of the 1901 census Percival was a fishmonger, living at 30 Beechcroft Road in Summertown with his wife Sophia and their four children; but their daughter Dorothy died at the age of 4 later that year. They were still at that address in 1911 with their four surviving children, all of whom were at school, and they employed a servant. Percival died at that address on 12 November 1924 at the age of 68. His effects came to £2,130 9s. 6d., and his executors were his wife and his son Alec, who was also a fishmonger. His son Alec became Lord Mayor of Oxford in 1963.